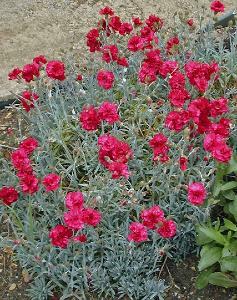 Dianthus 'Eleanor's Old Irish' is a lovely old variety with blue foliage that grows in a neat compact habit. Easy to grow in a sunny position even on clay soil. Flowers are highly scented, deep red produced during May-July and September-October. Hardy. Height 25 cm.